Hey, let me wear that baby!!!! He likes to help momma cook! You know, as a Mom, I think you are always trying to find ways to make your day run smoother. Smarter parenting techniques, ways to help meet the needs of both (or more) of your children. I think that has been the hardest thing about having two kiddos, just making sure all of their physical and emotional needs have been met for the day. At the end of the day, I can usually say they have been bathed, diapered, fed and possibly rested from naps, but sometimes I question myself if emotionally their needs have been met. For whatever reason, I feel like sometimes the emotional needs of babies and toddlers are put on the back burner. They are expected to act like adults and not be needy. But that’s just ludicrous I tell you. Babies and Toddlers are needy. And they are needy like they want you to hold them, rock them and hug them all the time! I don’t know about you, but I only have two hands, so when Jude came around, that made it quite a challenge to meet his needs and take care of Jackson’s. Here’s how things went with Mr. Jude. I call him my little fox, because I think he is sneaky. The first 6 weeks of his life, he was a pretty laid back little dude. Didn’t even cry when we changed his diaper. Really the only time he got super upset was if he wanted something and I wasn’t giving it to him fast enough, like food… this kid likes his food and he wants it like 5 minutes before he asked for it. But everything else was pretty chill with him. So what was I to do?? I had Jackson to take care of too, I couldn’t just sit and hold him all day long… we would have starved to death and never pottied!! Eek! You may think I’m being dramatic but this is not the case. Ask my hubbie. Ask my mom or my mother-in-law. 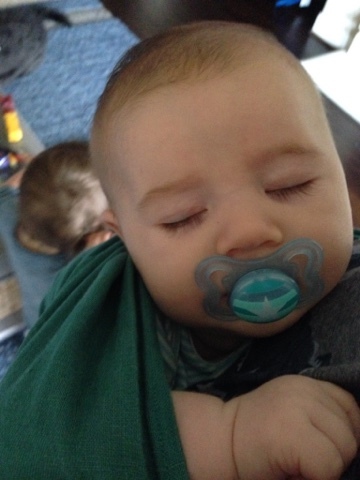 For a solid month, my sweet Jude did not want ANYONE to hold him except for me, and we’re not talking about just a little fuss fuss if someone held him… I’m talking all. out. screaming. his little head off until I came to his rescue. It was exhausting and draining. So again I ask you, what do you do? You get a ring sling. You go on Etsy and find a shop called Savy Designs 101 and buy a ring sling. It saved my life. I started using this after a couple of weeks of chaos with Jude and suddenly there was peace. My baby was happy, I was happy, and I could feed my toddler and play with him. We dubbed my ring sling the snuggle pouch, because my mom called it the “snuggle thing” and my mother in law called in the “pouch” hehe, so the snuggle pouch was born. But really, the bottom line to this post is that I am now a big fan of “baby wearing.” I love having him close to me and all snuggly in his snuggle pouch. It calms him. Jude is a sensitive baby. Jackson was too, but Jude more so I think. He is easily startled by movement, temperature, sound… So getting him all tight in the sling calms him and makes him more at ease. 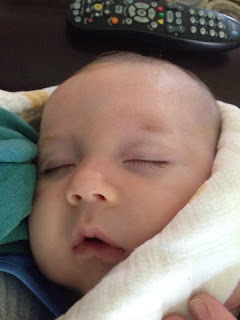 He was getting more rest as well so that also reduced how cranky he was being. 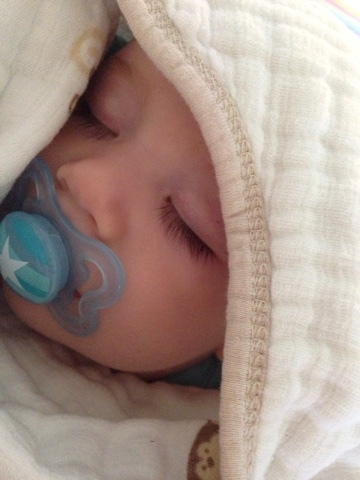 I mean who wouldn’t want to look down and see this precious face snoozing away?? Love him! So, being the former science teacher that I am, I wondered about the physical and psychological benefits from wearing Jude and keeping him close to me. I got a lot of comments and questions (not negative, just curious I think) about how much I was wearing him, some wondering if he would ever sleep on his own in a bed. But he does and he will. It has progressively increased over time, and he sleeps great in his bed at night. I know this will just be another thing that we wean away from. I mean who sees a ten year old riding around in one of these things haha?! But I checked out some websites and did some reading, and this is what I found. Babies cry less, and since they spend less time crying, they spend less time stressing about their environment and more time learning about their new surroundings. 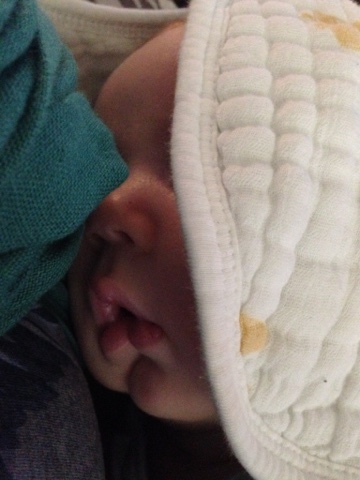 According to the La Leche League, parents worry that wearing their babies and keeping them close will cause them to be spoiled or cry more, but the reverse is actually true and helps him feel more comfortable in his world. Independence is established earlier. Infants that are worn tend to be more advanced in their motor skills, because their systems regulate more quickly from being near you. Babies that are worn tend to be smarter and also more familiar with human interactions. They see everything that you see and experience, so again this gives them more opportunity to learn! There is value for the mom as well… it is more convenient going out and getting chores done at home, but also it distresses her feelings and build confidence. She is able to relax and enjoy her baby more. 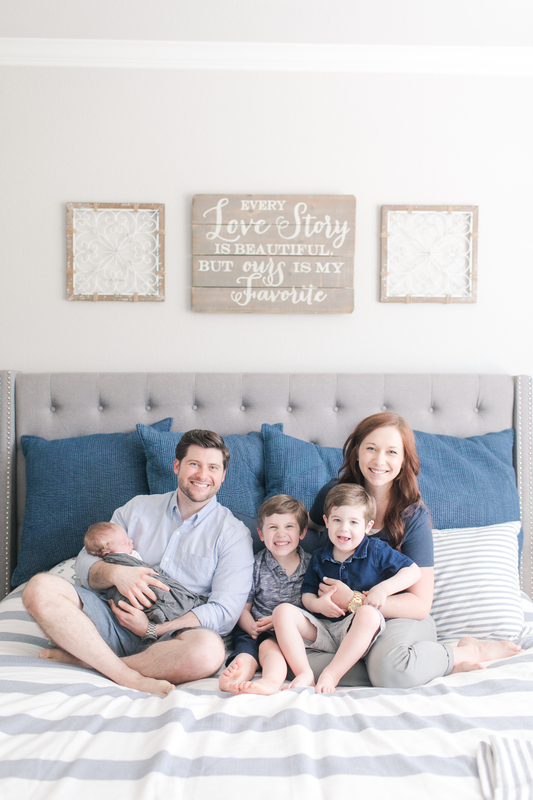 I asked my friend Julia at one point why it seems like people sometimes discourage comforting our babies… like don’t hold them too much, don’t rock them too much, don’t nurse them to sleep… those kinds of things. With Jackson I had those concerns but with Jude I have decided that I’m going to do what he needs because he will grow up and one day not need those things anymore. Babies and kids are always changing and forming new habits, and while you want to encourage good habits, I don’t think we need to worry about the ones that just provide the comfort that our children need. Not that I think we aren’t providing comfort, but you know, every parent is different and has a different approach to do things. All I’m saying is that I don’t think we should worry about implementing things that provide the comfort they want and just enjoy the moment hehe! They are so fleeting! 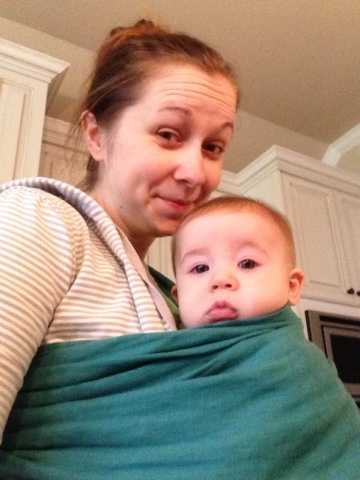 The ring sling has been my go to this time around, but I have also used the Baby Bjorn, Ergo Baby and Baby Katan. 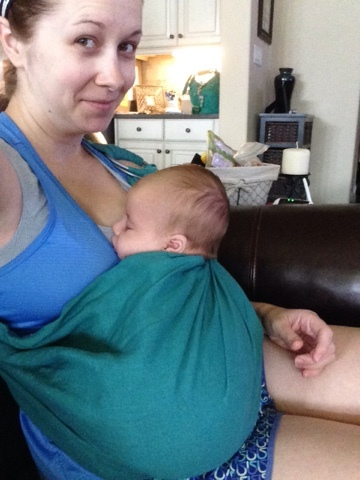 I have liked them all for different reasons… I liked the Ergo Baby for errands and going to do things/outings once Jackson got a little older. It is great for airports too! I liked the Katan a lot with Jude, but once he was getting bigger he didn’t fit as well in it. I know there are different sizes though so maybe a larger size would have last longer. I felt like the Baby Bjorn was more uncomfortable on my back but that is just my preference. So I hope that you found some of this interesting, I truly have! I love wearing my baby and am so glad that we found this tool. It has made our time together more enjoyable and less stressful for mommy for sure! I am such an advocate at this point because I see what it has done for my child, and I would wish those benefits for everyone! 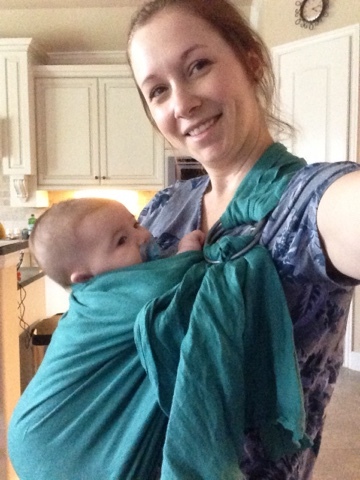 Here are some more baby wearing babes! 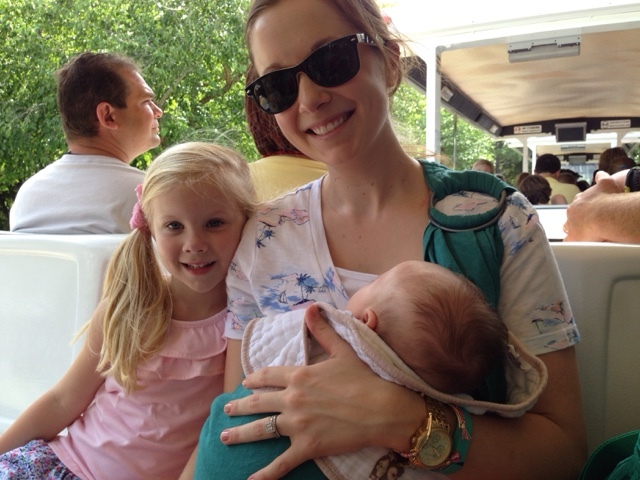 These are some of my dearest friends, who have also seen the advantages in keeping their sweet girls close! 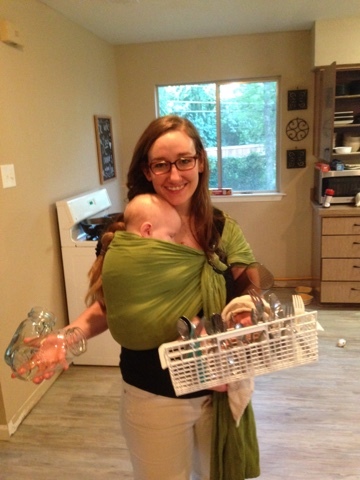 I call Julia the Ring Sling Queen, because she is so good at using her sling with her babies! She has given me some tutorials even on how to get them all nice and snuggly, safe and tight! She is the ring sling queen for a reason I tell you!! 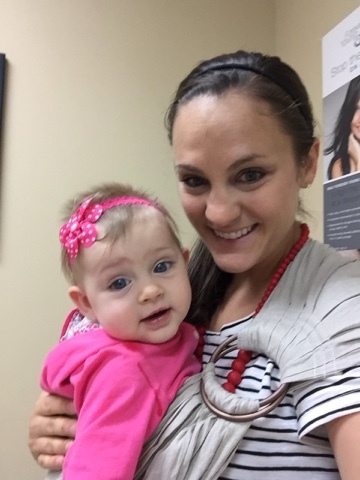 My friend Jessica and her sweet Layna at the doctor’s office!